The club can be rented for private or corporate events and parties. The club has often been rented for a combined curling and social event. The full club rental includes use of the curling rink and the upstairs lounge with bar and bartenders The lounge and bar can also be rented alone, without the curling rink, to use for parties. The upstairs area offers a fully equipped kitchen and a fully licensed bar. The comfortable capacity of the upstairs lounge is 100-110 people. 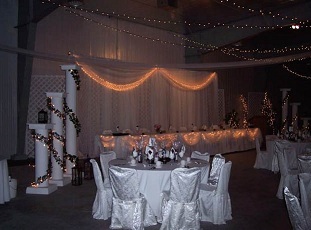 After the curling season is over, the rink area is transformed into a "fairy tale" wedding facility. Mini lights are strung from the ceiling and adorn the white lattice panels around the perimeter of the room. Past guests have been amazed that it is actually a curling rink in the winter. The room can accommodate 100 - 500 guests. The lattice wall at the back of the arena is movable to enable adequate space for a large crowd or be moved in to provide a more intimate area for a smaller reception. The rental rate includes the fully licensed bar and bartenders, rectangle tables, and chairs. The fully equipped kitchen upstairs can be used for an additional fee. We can provide wine for the dinner tables, or you can make your own and obtain a special occasion permit instead.